Pistou is a combination of garlic, basil, tomato Parmesan cheese, olive oil,salt and pepper. 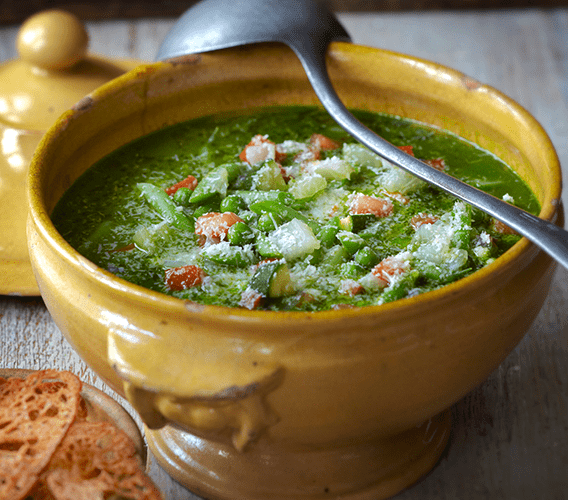 In this recipe is used to flavor a soup containing beans, onions, celery, zucchini and green beans. The pistou is added to the soup and is also served in a bowl along side of the soup should you desire additional flavor. Drain the beans and place in a soup pot. Add onion, celery, green beans, zucchini, tomatoes, salt and pepper. Cook until the beans are nearly tender, about 30 minutes more. To make the pistou, in a bowl of a food processor, combine the garlic and basil and process until finely chopped. Add the tomato and process until fully incorporated. With the motor running, slowly add the oil and process until smooth. Add the cheese, salt and pepper and process until incorporated. Add the pasta to the soup and cook until the pasta and beans are tender, about 12 minutes, then season with salt and pepper and stir in the tomato paste..
Stir 2 tbs of the pistou mixture into the soup and ladle into bowls. Serve the remaining pistou alongside. Optional: if desired you may add sliced sausage or chicken to the soup.